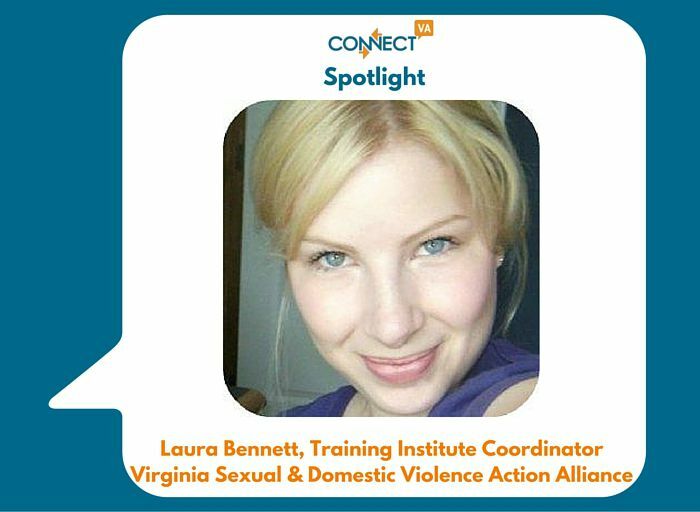 I’m Laura Bennett, Training Institute Coordinator for the Virginia Sexual and Domestic Violence Action Alliance. I have worked in the nonprofit sector in various roles – education, training, capacity building, board development, administration, operations, and policy for about 14 years. I am new to the Action Alliance, I started in February of this year. I focus on training and education in the field of sexual and domestic violence – all for the purpose of building and enhancing the capacity of our members to provide critical services to survivors of violence. We also provide education and training to allied professionals and members of the community. Ongoing training and education is vital to carrying out our mission of creating a Virginia free of sexual and domestic violence. I love hearing from the people who participated in a Training Institute event that our training enables them to do their work better. It is most rewarding when someone tells us that our training made them think about something in a completely different way. The biggest challenge is the amount of work to be done with limited fund capacity. We have so many dream projects that we are excited about and that the field would benefit from but we are constrained by the realities of the challenges facing most nonprofits – capacity, time, and resources! We have addressed this challenge by developing a very detailed multi-year plan for the Training Institute and tackling our dream list piece by piece. Tackling the dreams for the Training Institute outlined in our multi-year plan and making them a reality, one step at a time. In the near future we will be using technology in exciting and accessible ways to reach a broader, more diverse audience. This will include micro-learning, virtual peer communities, and the use of open badges to incentivize learning. We appreciate the connections and marketing that ConnectVA provides us. We can bring our mission and our opportunities to the broader nonprofit community. Many people don’t realize how we can connect with them, or how training professionals on how to respond to and work with survivors of interpersonal violence can improve their own work within our shared community. Lifelong learning and professional development are the keys to the sustainability of all nonprofits and I am excited to be part of the nonprofit community, particularly the sexual and domestic violence field, every single day.